Well, it's official. Please welcome Brady Hoke as Michigan's next head football coach. ANN ARBOR – University of Michigan Athletic Director Dave Brandon announced today (Tuesday, Jan. 11) the hiring of Brady Hoke as the 19th coach in the 131-year history of Michigan football. Hoke arrives in Ann Arbor after spending the past eight seasons as a head coach at Ball State (2003-08) and San Diego State (2009-10). Hoke spent eight seasons in Ann Arbor before embarking on his head coaching career. He mentored the Wolverines defensive line all eight seasons, a group that helped Michigan rank annually among the nation’s best in rushing and total defense. Hoke coached three linemen to All-America honors during his tenure – William Carr (1996), Glen Steele (1997) and Rob Renes (1999) – and had five players earn first-team All-Big Ten accolades. A member of Michigan’s national championship staff in 1997, Hoke helped the defense lead the nation in rushing defense at 89 yards per game and 2.7 yards per carry. Michigan’s team posted a 5-3 record against Michigan State, Ohio State and in bowl games during Hoke’s tenure on the staff. 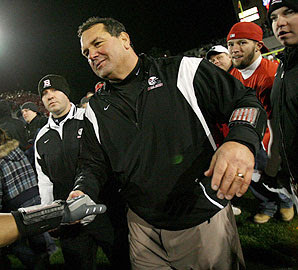 Hoke was named the 2010 Mountain West Conference Coach of the Year after guiding the Aztecs to a 9-4 overall record and 5-3 conference mark. He led SDSU to its first bowl game in 12 years, a 35-14 victory over Navy in the Poinsettia Bowl. Six of his players earned first-team All-MWC honors in 2010, including running back Ronnie Hamilton, the league’s freshman of the year. In his first season at San Diego State, Hoke had five players named to All-MWC teams, while 11 players were MWC All-Academic selections. Hoke took the leadership position at his alma mater, Ball State, in 2003 and built it into a championship program before departing after six seasons for the West Coast. He mentored players to 35 All-MAC selections in six years en route to a pair of bowl game appearances in 2007 and ’08. The 2008 season marked the best season in program history, tallying a school-record 12 wins and completing an undefeated Mid-American Conference regular season campaign. His team won the west division championship in 2008 and shared the division crown in 2007. Hoke has 28 years of collegiate experience, with assistant coaching stints at Grand Valley State (1983), Western Michigan (1984-86), Toledo (1987-88), Oregon State (1989-94) and Michigan (1995-2002). A 1982 graduate of Ball State University, Hoke earned four letters (1977-80) with the Cardinals. He was part of the only two teams in school history to post undefeated conference seasons: as a player in 1978, and as head coach in 2008. Hoke led BSU to the 1978 MAC championship, and as a team captain in 1980 earned All-MAC second team honors. A native of Dayton, Ohio, Hoke graduated from Fairmont East High School in 1977. Hoke and his wife, the former Laura Homberger, have one daughter, Kelly. Michigan Athletic Director Dave Brandon will hold a press conference to introduce Coach Hoke on Wednesday (Jan. 12) at 1 p.m. EST. The media opportunity will be held at the Junge Family Champions Center located between the Michigan Stadium and Crisler Arena tunnels. The press conference is not open to the public. Both Brandon and Hoke will be unavailable for media interviews until tomorrow’s press conference. Much more to come on this. But for now, sit back and enjoy the fact that the search is over, and Michigan has landed itself a very good coach.